We generally imagine about having wings and flying to see the world from the high level. Though naturally we have no such modification in the body but the development of technology have made it possible to fly above the ground level and take a view of natural environment. Besides this, reaching to the desired destination within short time period have becomes easier with the invention of these technological mediums. Though we lack wings and structure that benefits us in flying, but there are certain groups of animal that have well developed body plan to make the flight possible above the earth. Animals that come under this group have well modified body that makes them easy to soar above the ground. Hence, they come under one class of vertebrates called Aves. Hence, this is the major classification of Aves beside this; it is divided into two orders called Passeriformes and Galliformes. Further, Passeriformes is again sub-divided into different groups. We commonly dignify them as birds. They are warm blooded animals. They have a pair of legs to move on the ground. The presence of exoskeleton in the surface of the body. Body divided into head, long neck, trunk and tail. The neck is long in order to maintain the balance of the body. 2 pairs of limbs are present. Forelimbs are modified for flying whereas hind limbs have legs that help birds to move on the ground whenever necessary. Presence of four chambered heart for circulation. Bones are light and not very heavy for balancing the body. Communication through unusual sound or singing. These are some of the characteristics that can be noticed in Aves that keeps these groups of chordates in separate class. Birds have short body with compact bones. This reduces the weight of the body and makes it light. There are different kinds of feathers present in birds: outline feather helps to decrease the drag of the body by making it streamlines; primary feathers helps to provide shape to the wings and make the flight possible; tail feather are used as rudder for balance of the body. Bones in birds are either hollow or fused to reduce the weight of the body. The fusion of caudal bone to form pygostyle and hollow bones of skull are good example of it. Absence of teeth and present of beak is also one of the important adaptations for flight in birds. Forelimbs are modified into wings and hence aerodynamics in shape. They are also close to the centre of gravity. 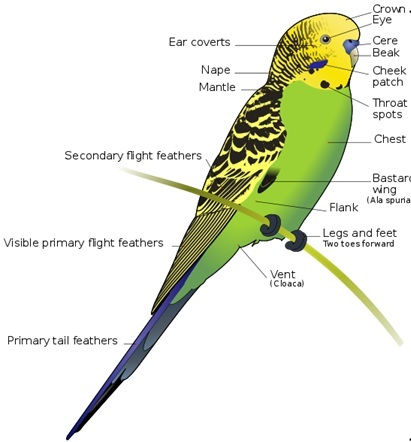 Different muscles present in birds helps in the movement of legs, wings, neck and tail. Mainly wings are made of strong muscle so as to provide energy for flying which are called pectoral and breast muscles. Birds generally eat foods that are small and light but which high source of energy. They have gizzard that helps to grind the eaten food and absorb it. Beside this, some birds also have crop that aids in softening and absorbing of eaten food. The most developed system in birds is the respiratory system. It is highly developed because of the energy required for flying mechanism. Though the lungs are relatively small but there is a great interconnection with the inner organs which generates the required energy. The air that is taken in passes to the air sacs on the posterior side then reaches the lungs. Similarly, when on second breathing; the air that is already present in the posterior side rushes to the anterior side thus leaving the space for next round of breathing, and then the inhaled air enters the posterior side. This way exchange of gases takes place. Generally most of the birds have only one way of air current but there are also some that possess bi- directional air current. Birds lac alveoli, instead many small sacs called parabronchi are present that are connected to the capillaries. The circulation of blood uses four chambered heart with two atria and two ventricular. Blood with high blood pressure and high amount of sugar is present in the avian heart. 11. Eyes are well developed having binocular vision in birds whereas the olfactory organs have reduced function. It is because good sight is necessary for safe flight. Ovaries and testis are present but the size is reduced, in some only one ovary is functional.